On January 15, YouTube will delete every video annotation. Annotations were never supported on mobile devices, and would have been awkward to implement on small screens. It was difficult to support across devices, including TVs and other third-party hardware. 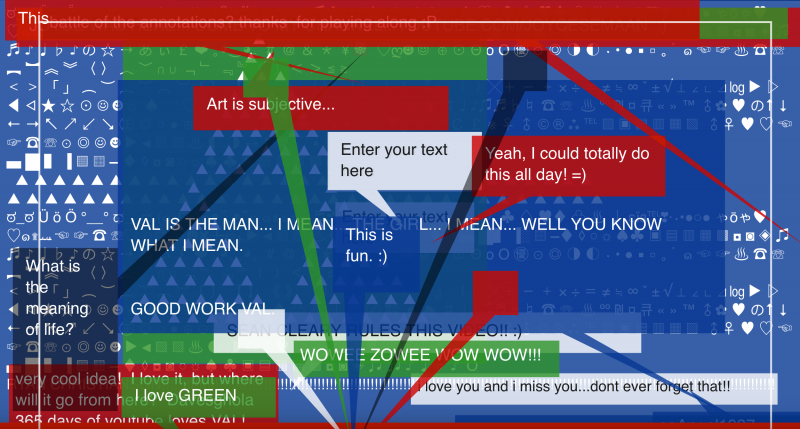 Most annotations were obnoxious, like popup banners and spammy notes hiding the video. But YouTube annotations were supported for nearly a decade, and a significant number of creators used them to great effect — games, interactive art, education, footnotes, and corrections — and removing them fundamentally and irrevocably breaks a core part of YouTube history. Here’s just a small piece of what we’ll lose in two months when annotations are gone. Watch them while you can. Note: All the videos below must be viewed on a desktop browser with annotations enabled. From the moment that YouTube announced Annotations in June 2008, they were already proposing its use for the creation of games and interactive stories. The blog post links to this simple Shell Game video from May 14, 2008 as an example, quite likely the first YouTube game ever made. Annotations were particularly well-suited for choice-based Choose Your Own Adventures, stringing together a collection of videos that let viewers decide the story. The first I remember was Tube Adventures, a simple Spanish choose-your-own-adventure video. Terminator Interactive Game, a simple FPS by a 12-year-old boy, showing just how accessible these games were to create. Stupid Mario Brothers took a live-action, and occasionally NSFW, approach to the Mario franchise, while Choose A Different Ending took a more gritty approach. YouTube creators Chad, Matt & Rob pushed the genre further with a series of five interactive adventures: The Time Machine. The Treasure Hunt, The Teleporter, The Birthday Party, and The Murder. By 2014, filmmakers were using annotations to make interactive films with bigger production values and more attention to storytelling and screenwriting, winning nominations and awards for their innovation. Love & Engineering let you use annotations to switch between characters and story world at any time, with four filmmakers, two characters, and one persistent chat conversation. Sirens tells the story of a young man asked by his fugitive brother to retrieve a mysterious bag. La Linea Interactive is a tribute to cartoonist Osvaldo Cavandoli’s animated series, using a series of buttons to determine the story. Complex programming wasn’t an option, but many other genres of gaming — including adventure, shooters, and trivia — were all possible using simple hotspot/linking schemes, and particularly popular with brands for advertising. Here are some highlights. Though they’re best known for the enormously popular React channels, The Fine Brothers made a series of 8-bit style interactive games based on Twilight, Mad Men, Freaks & Geeks, and Saved By The Bell, among others. Starting days after the 2008 election, Barack Paper Scissors eventually sprawled into 15 levels with over 1,000 videos and 3,000 annotations. YouTube Street Fighter is exactly what it sounds like. Bboy Joker is like a memory game meets stop-motion dance battle. Blend Your Own Adventure. Remember BlendTec? Pick any two items, and Corey Vidal will blend them up, and drink the results. Here’s an odd one: someone recreated a non-interactive Tetris playthrough with tiny annotation blocks. Turning off annotations just shows a blank video. Possibly my favorite annotated YouTube video of all time, Neil Cicierega’s Haircut is an interactive adventure song you won’t want to miss. The band Moones recorded five music videos at various states of drunkenness from 20-80 beers, letting you use annotations to jump between their increasingly sloppy performances. Make Me Play a Song lets you choose piano keys to string together a song played on guitar. Constantly strumming guitar chords, The YouTube Electric Guitar turns the players into an instrument. With changes to the embed, the chord annotations are now covered by the interface. Try the Theater Mode for best results. Adam Ben Ezra created YouTube Radio, an interactive radio letting you switch between genres of short songs and jingles he created. What if YouTube comments were directly on top of the video instead of underneath it? If this sounds like the worst idea of all time, you’re not far off. Likely inspired by the popularity of Nico Nico Douga in Japan, YouTube announced Collaborative Annotations only eight months after launching Annotations, allowing video creators to invite others to add collaborations, or just post it publicly and wreak havoc. But it wasn’t all bad. This video claims to be the first collaborative art project, burying the underlying video in annotations created by anyone. TVTropes documents the history of The Annotated Series, a channel devoted itself to heckling videogame-related animated series, uploading episodes with open annotations for the community to contribute. Several of their accounts were shut down for copyright strikes, but many are preserved with annotations baked into the videos for posterity, and others available on their new channel. In “Let’s Jab” videos, contributors are encouraged to add their annotations to Let’s Play videos. Nonetheless, the ability to creative annotations collaboratively was shut down a year later. In the launch announcement, YouTube pointed to this skydiving video as an example of how annotations could be used to deepen videos, easily giving additional commentary without editing the video itself. Shout Factory used annotations to provide context to full-length Mystery Science Theater 3000 episodes, explaining every obscure reference. Videogame historian Frank Cifaldi used annotations to give detailed notes about the Japanese-only NES game Mr. Gimmick in a four-part longplay. Annotations could be used for providing a handy table of contents to many other videos, or simply skipping around in the same video. By far, the most-viewed annotations ever have to be the ending of nearly every Movieclips video, which lets you select other scenes from the same movie, clips from movies by the same cast and crew, and related clips by genre, mood, or setting. With over 30,000 videos and 18B views, every annotation link in their pre-2017 videos will break in January. Composer Austin Wintory used annotations to provide running commentary for the complete Journey soundtrack. Here, a filmmaker uses annotations for director’s commentary. Not interested in the commentary? Turn off the annotations. Annotations can be used for providing additional context on historical footage, as in this footage of the 1975 German Grand Prix. As viewership shifted to mobile, creators stopped using annotations for critical features or creative experimentation because there was no guarantee a viewer could enable them. But there was still one place creators used annotations: for providing corrections after a video’s release. Because YouTube doesn’t provide a way to replace a video, making meaningful edits is impossible. So many creators continue to use annotations to correct mistakes or add additional context inline, at the appropriate part of the video. Unfortunately, all of those footnotes, errata, and additional context will be permanently lost. If you’re a YouTube creator who actively used annotations, there’s not much you can do. The youtube-dl utility offers a “–write-annotations” option to save annotations to XML, but I don’t think any other site supports it. If there’s a video you loved that used annotations heavily, I encourage recording yourself playing through it just for posterity and uploading it to YouTube. It won’t be the same, but it’s better than nothing. Did I miss your favorite use of YouTube Annotations? Leave a comment or hit me up on Twitter. My little addition to this: Dan Bown’s “Who Wants To Be A Youtubillionaire”, a youtube-based “Who Wants To Be A Millionaire” game with Youtube celebrities as your “phone-a-buddy” lifelines. Done in 2009. Thanks, Karen! I linked to Dan’s video as the “trivia” link in the Games section above, but it’s easy to miss. Idea: Archive.org makes a data miner that grabs gazillions of existing XMLs (I suppose they are delivered when viewing a video in some way). Then using the YouTube API, they make a website where they offer viewing of all those videos with the annotations as overlays using their own custom JS/CSS reading from the same XMLs they now store.